Mayor Stefan Freitag calls the competition "favourable for Velbert, for Germany and for Europe"
Names like Konrad Ragossnig or Costas Cotsiolis make the hearts of enthusiasts flutter. The young professionals feel great honour to perform face to face with those personalities. ... compete promising young musicians peacefully according to the idea of international understanding through the media of music ... so the competition becomes a festival for Velbert, its neighbouring towns and the whole region. The audience in the completely filled Congress hall of the Forum listened breathlessly to the fascinating playing of Eliot Fisk. The performance of this American artist demonstrates world class. His widow Marquesa Emilia Segovia considered the naming as an honour and therefore was willing to take over the patronage of this competition which is unique in Europe. The sight of a gentleman leaning against the Iveco equivalent of a Mercedes-Benz Sprinter is one that rarely has the capacity to either gladden or sadden. But since the man with the van was Uwe Trekel, roving representative of Haus der Musik Joachim Trekel, I now knew for certain I'd reached the right place. Whenever there's a gathering of guitarists in this part of the world, Uwe is sure to be on site with a meticulously indexed display of music, CDs and related goodies. The small town of Velbert, a short drive from Düsseldorf, is no exception. Presided over by the imposing yet genial figure of Alfred Eickholt, renowned pedagogue and juror of long standing at Nürtingen and elsewhere, the event is perhaps best seen as a festival and competition with the emphasis on the latter. Each of the age groups (under-14, 14-16 and 17-19) has its own jury, proceedings taking place simultaneously in different locations. 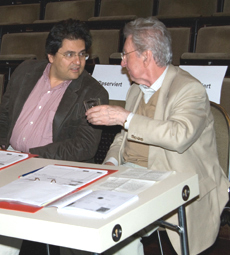 A glance down the list of jury members revealed a distinguished line-up, many being high-ranking performers in their own right. So it was that I renewed my acquaintance with Raphaella Smits (Belgium) and met for the first time Costas Cotsiolis (Greece) and Martha Masters (USA) without hearing any of them strike a note. And then there was the unassuming octogenarian who introduced himself with the words: "Hello, my name is Konrad". Having admired Konrad Ragossnig's work from afar since adolescence, it was a privilege to meet the man and to mention in passing that I own a modest cross-section of his extensive back catalogue, all carefully preserved on vinyl. But although the illustrious figures named above were to be absent from the platform, public performance was a key part of the Velbert mix, starting with an opening ceremony complete with tangos from a tightly drilled local chamber orchestra. The tango was to be a theme for 2012, although I state with undisguised relief that this wasn't reflected in the compulsory pieces for the competition. It was, however, the central element and maybe even the principal raison d'être behind an enthusiastically-received innings on the second evening by the dynamic and engaging Duo Bandini-Chiacchiaretta. Comprising Giampaolo Bandini (guitar) and Cesare Chiacchiaretta (bandoneon), this able and established pairing has built up a cult following by offering a niche programme in which the featured composer is, both reasonably and almost inevitably, Piazzolla. Now I'm not going to pretend to have undergone a Damascene conversion, but I willingly concede that the brilliance and exuberance with which these guys deliver the goods is persuasive. This said, the programme in Velbert bore more than a passing resemblance to the one I'd witnessed at Nürtingen in 2010. A more seasoned observer confirmed that he'd been served much the same agenda on at least ten previous occasions. So it would seem that Bandini and Chiacchiaretta offer an experience not to be missed, but not necessarily one to be repeated. By this time, the competition had reached something approaching the halfway stage. The "international" label proved more than justified, a rough head count revealing the presence of competitors from at least twenty countries. It seems the sole UK representative was James Swarbrick, a student of Wendy Jackson at Chetham's School of Music. But for reasons unknown, the nationality given on the programme was Russian, which came as a surprise both to young Swarbrick and to his father, whose Bolton accent is almost as pronounced as mine. As it turned out, players who really are from the former Eastern Bloc were present in significant numbers, but the country that dominated much of the after-hours conversation was China. 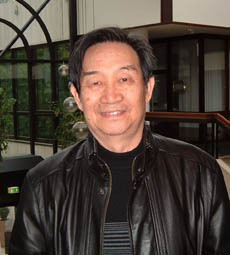 The Velbert format is such that nobody gets to hear every competitor, but I happened to be watching the youngest category when a diminutive figure named Shi Long Fan wowed all present with the Allegro Assai from J.S. Bach's Violin Sonata No.3 BWV 1005. This would be a testing choice for a late teen or beyond, so to witness it performed with style and elegance by a ten-year-old was noteworthy to say the least. What I didn't know at this point was that Shi Long Fan was not a lone voice and that a slightly older compatriot had made a similar impact on the previous day. Our eyes and ears were again cast in an easterly direction for the ensuing European debut of the Beijing Angels Guitar Quartet, an all-female foursome with ages ranging from 17 to 22. Secure ensemble, strong projection and a fine balance were soon established and remained in place throughout. As for the programme, an LAGQ influence was unmistakeably present, with Hungarian Rhapsody No.2 plus selected movements from the Nutcracker and Carmen suites serving as principal showstoppers. Most memorable of all were two items by Eduardo Martin, a further name from the LAGQ roster, the Suite Habana, possibly better known as a piece for flute and guitar, leaving the most favourable impression of the evening. All this leads to a slight concern about the choice of collective title. The inherent cheesiness bothers me not one jot, but the possibly unintentional evocation of the home city of the Californian big hitters could cause the Beijing Angels to be miscast as a de facto tribute act. So it must be hoped that, with time, these outstanding newcomers will develop the conviction do their own thing and fly under their own flag. Anyone who knows the turf will be less than astonished to learn that there was a guiding background presence and that his name is Chen Zhi. A sprightly septuagenarian whose energy and enthusiasm remains undiminished, the man immediately recognised me from some distance away, despite our last encounter having taken place more than a decade ago on the other side of the planet. As mentor to Shi Long Fan and the Beijing Angels, it was already clear that Chen Zhi's long-haul flight had been worthwhile, the final icing on the cake emerging when Shi Long Fan shared first prize in the under-14s with twelve-year-old Hao Yang. Is it necessary to say who taught her? Penultimate on the bill at the winners' concert, Hao Yang delivered a barnstorming Fuoco from Dyens' Libra Sonatine, which served as a gripping contrast with the more cerebral yet exhilarating rerun of the Bach from Shi Long Fan. Did I really just say all that about two kids born on and after the turn of the millennium? The 14-16 group brought victory for Vassilis Digos from Greece, his fearless and near-flawless take on the set piece, Rumores de la Caleta by Albéniz, confirming that the judges had chosen wisely. From the senior group emerged the already familiar name of Xavier Jara, whose 2011 victory in the GFA youth competition was widely known prior to his arrival in Velbert. 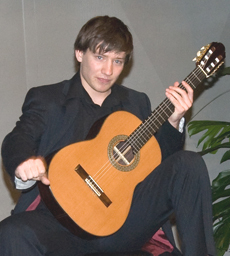 Jara's mature interpretation of the Elegy by Alan Rawsthorne was also a strong contender for the EGTA prize for best performance of a work composed after 1950, although this was eventually awarded, by a majority decision, to Kacper Budziszewski (Poland) for his Rodrigo Zapateado. Finally, luthier Constantin Dumitriu from Romania presented his own special prize, a swish new concert guitar, to Jessica Kaiser (Germany), who had shared second prize in the senior group. I can't say what type of instrument Kaiser had been using prior to this, but the improvement in tone and sustain when she took a brief lap of honour on Dumitriu's instrument was striking. My warmest thanks to Alfred Eickholt and to co-ordinator par excellence Heinz Küpper for what may well have been a preview of tomorrow's star players. I'm making no predictions, but I won't forget the names. Mit einem Preisträgerkonzert auf höchstem Niveau ging der 6. Jugendwettbewerb für Gitarre "Andrés Segovia" im Forum Niederberg zu Ende. Noch einmal zogen die jungen Musiker alle Register und begeisterten die zahlreichen Zuhörer. "Ihre Ohren werden Augen machen" hatten die Organisatoren der Musik- und Kunstschule, der deutschen Abteilung der European Guitar Teachers' Association (EGTA-D) und ihre vielen Helfer mit der Betitelung des Höhepunkts des Wettbewerbs versprochen - ein Versprechen, das eingehalten wurde. Zunächst betraten die Jüngsten, die Vertreter der Altersgruppe I (bis 13 Jahre), die Bühne. Schon ganz Profi, sagte Alecu Ciapi aus Rumänien (3. Preis) seinen Beitrag auf Englisch an, nahm Platz auf der bereitgestellten Klavierbank und legte los mit einem Tango von Francisco Tárrega. Zum Staunen brachte die eine der beiden Erstplatzierten, die Chinesin Kaiieng Chan, das Publikum mit ihrem Vortrag von Roland Dyens "Fuoco" aus der Libra Sonatina. Musikalität, Dynamik, höchste Fingerfertigkeit, alles schon da - da fragte sich mancher, wie sie wohl spielen würde, wenn sie einmal erwachsen ist. Von einem Dilemma berichtete Heinz Jürgen Küpper, ehemaliger Musikschulchef, Organisator und Moderator des Konzerts, nach den Auftritten der Preisträger der Altersgruppe II (14 bis 16 Jahre): "Was Sie hier sehen, ist ein Zeichen der Verzweiflung der Jury - wir haben zu wenige Preise!" Denn obwohl es eigentlich nur fünf Preise pro Gruppe zu erspielen gab, waren es hier gleich sechs. Zu erneut zwei ersten Preisen gesellten sich vier dritte Preise, darunter einer an den Deutschen Niels Pfeffer, der beim Spiel von Armand Coecks "Constellations" selbstvergessen den nachdenklich gestimmten Klängen nachspürte. In der Altersgruppe III (17 bis 19 Jahre) gab es diejenigen zu hören, die zweifellos eine musikalische Karriere anstreben - darunter der mehrfache Preisträger Janko Raeta aus Polen (3. Preis). Als Neunjähriger hatte er erstmals in Velbert gespielt. Der Sieger unter den Ältesten, der Südkoreaner Jin Sae Kim, gewann zudem eine Gitarre des rumänischen Gitarrenbaumeisters Constantin Dumitriu. Nun, und den größten Applaus erzielte ein Russe aus der Altersgruppe II, der damit gar nicht gerechnet hatte: Aleksej Kotyurov erhielt den extra aufgrund dieses Gitarrenwettbewerbs entwickelten Prototypen der Firma Karl Höfner aus den Händen von Gitarrenbaumeister Friedemann Pods. Der junge Mann ließ sich nicht lumpen, nahm uneingespielt im T-Shirt Platz, um dem ihm bis dahin völlig unbekannten Instrument ein wahrhaft virtuoses Stück zu entlocken. Fabian Hinsche, 1982 in Velbert geboren, kehrt beim 6. Internationalen Gitarren-wettbewerb, der in dieser Woche beginnt, zu seinen Ursprüngen zurück. Der Meistergitarrist, Stipendiat der "Richard-Wagner-Stiftung" und der "Yehudi-Menuhin-Stiftung" und Gewinner nationaler wie internationaler Wettbewerbe, arbeitet als Lehrer an der Musikschule Solingen. Als Musiker kommt man zwar viel herum, aber man spielt eigentlich selten zu Hause. So ist es eine besondere Freude für mich, dass ich in meiner Heimatstadt wieder auftreten darf. Natürlich verbindet mich viel mit dem "Segovia"-Wettbewerb, weil das damals ein großer Erfolg für mich war. Übrigens schicke ich jetzt auf diesen Wettbewerb zum ersten Mal einen eigenen Schüler. So schließen sich gleich zwei Kreise. Was hat Sie bewogen, Künstler zu werden? Im Alter von vier Jahren geriet ich an der Velberter Musik&Kunstschule mit Giselher Jung an einen Früherziehungslehrer, der auch Gitarre unterrichtete und mir das Instrument schmackhaft machte. Schon früh, ab etwa 13 Jahren, spielte ich auf Wettbewerben und besuchte deutschlandweit Festivals und Meisterkurse. Die dortige Szene mit vielen netten Gleichaltrigen und Gleichgesinnten hat mich fasziniert. Seitdem stand fest, dass ich diese Richtung einschlagen wollte, und ich habe es bis heute nicht bereut. Kann man davon leben? Ist Kunst doch nicht so "brotlos"? Zwar ist die Gitarre ein sehr populäres Instrument, jedoch gehört sie leider nicht in die erste Reihe der etablierten Konzertinstrumente. Weltweit kann nur eine Handvoll Gitarristen ausschließlich vom Konzertieren leben. Insofern braucht man als zweites Standbein immer das Unterrichten. Wenn man auf dem Instrument überzeugt und sich gut vermarktet, kann man den Unterrichtsanteil so klein halten, dass genug Kraft für den künstlerischen Bereich bleibt. Wenn man dann noch die breiten Möglichkeiten nutzt, die die Kammermusik gemeinsam mit anderen Musikern bietet, dann kann man ganz gut davon leben. Sie gestalten das Konzert am Freitag zusammen mit zwei weiteren ehemaligen Preisträgern späterer Velberter Wettbewerbe: Sabrina Vlaskalic aus Serbien und Sanel Reić aus Bosnien. Ist das Konkurrenz? Kennen Sie einander? Beide kenne ich dem Namen nach von Wettbewerben, aber bisher nicht persönlich. Sabrina hat ebenfalls bei Carlo Marchione in Maastricht studiert, aber sie kam erst, als ich dort schon fertig war. Mit Sanel habe ich ein paar E-Mails ausgetauscht. Konkurrenz? Nein. Bei Wettbewerben mag es um Perfektion gehen, in Konzerten geht es darum, die Leute emotional zu bewegen, zu berühren. Und wenn dies dem einen gut gelingt, dann wird der andere nicht neidisch sein. Wir haben die Lebensläufe von Ihnen gelesen. Sie Drei haben zusammen genommen 36 erste Preise auf internationalen Wettbewerben abgesahnt. Was bedeuten Ihnen Wettbewerbe? Vor Fachpublikum eine optimale Leistung zu bringen, war für mich zu meinen Studienzeiten immer ein besonderes Ziel, ein Motor, und ein Grund, etwas stolz auf die eigene Disziplin zu sein. Außerdem brachten Wettbewerbe wertvolle Fachkontakte und etwas Geld. Nicht zuletzt habe ich dort auch viele Freundschaften . Allerdings ist diese Zeit nun vorbei für mich. Man sieht nun klarer, dass auch der Gewinn eines der ganz großen Wettbewerbe keineswegs ein Garant für die Karriere ist. In meinem Alter gilt es nun, sich zu einer Art Künstlertum zu bekennen, wo es nicht auf "höher, schneller, weiter" ankommt. Als Künstler müssen Sie selbstverständlich topfit sein. Wie machen Sie das? Bleibt noch Zeit für etwas anderes? Ich unterrichte und nebenbei studiere ich noch Kulturwissenschaften, da habe ich viel zu tun. Für wichtige Konzerte, wie das in Velbert, zwacke ich dann an allen Ecken Zeit ab, um auf die erforderliche Übezeit zu kommen. Es gibt Künstler, die setzen täglich vier Stunden regelmäßigen Übens an, andere kommen mit weniger aus. Ihre Hände sind Ihr Kapital. Haben Sie die für eine Million versichert? Tragen Sie auch im Sommer Handschuhe? Nein, die trage ich nur im Winter. Und versichert sind die Hände auch nicht. Allerdings gehe ich nicht ganz so sorglos an alle Arbeiten heran. Für klassische Gitarristen kommt noch etwas Besonderes hinzu: man trägt an der rechten Hand die Fingernägel sorgfältig gefeilt recht lang, und je nach natürlicher Härte der Nägel muss man gut aufpassen, dass man sich sein "Handwerkszeug" nicht ruiniert. In der Pubertät ist das natürlich besonders spaßig, wenn man als Junge im Bus mit langen Nägeln unterwegs ist. Schließlich etwas Privates. Die Redaktion hat gehört, dass Sie gerade eine knappe Woche verheiratet sind. Ist Ihre Frau denn auch Künstlerin? Ja, beides stimmt. Meine Frau ist auch Musikerin, sie ist Mandolinistin. Wir sind zwar beide Solisten, aber wir haben uns nicht nur privat, sondern auch musikalisch gefunden. Daher fokussieren wir uns beide im Moment auf das Duo-Spiel. Übrigens konzertieren wir beide einen Tag nach dem Velberter Wettbewerb in der Nähe von Mannheim unter dem Namen "MareDuo". Vielleicht ist hier ein bisschen Werbung für unser Duo erlaubt, denn wir nehmen auch gegenwärtig unsere erste CD auf. Im gemeinsamen Musizieren lässt sich bei aller Professionalität das Persönliche nie ganz ausblenden. Insofern empfinden wir unsere Beziehung in mehrfacher Hinsicht als glückliche Fügung. Velbert ruft und aus 20 Ländern kommt das Echo von jungen Menschen, die sich der Gitarre verschrieben haben, dem beliebtesten Instrument der Welt. Zum 6. Mal wird über das Fronleichnam-Wochenende der Jugendwettbewerb „Andrés Segovia“ im Forum Niederberg ausgetragen. Die Anmeldephase ist gerade ab mit dem Ergebnis, dass rund 80 Gitarrenvirtuosen im Alter von 9 bis 19 Jahren zusammen mit begleitenden Eltern und Lehrern nach Velbert reisen werden, um sich miteinander zu messen und wertvolle Erfahrungen auf internationalem Parkett zu machen. Denn mittlerweile hat es sich von Sibirien bis Sizilien herumgesprochen: ein Preis in Velbert ist eine wichtige Stufe der Karriere. Und wer jemals Zeuge der abschließenden Preisträger-Konzerte war, weiß warum. Hier gibt sich die Gitarrenelite der Zukunft ein Stelldichein. Es ist kaum zu glauben, was diese jungen Leute aus ihren Instrumenten zaubern. Insofern ist es sicher nicht falsch, den 5. Juni für das diesjährige Preisträgerkonzert schon jetzt im Terminkalender vorzumerken. Fünf Mal wurde der Wettbewerb auf europäischer Ebene ausgetragen, in diesem Jahr wurde er auf die ganze Welt ausgeweitet. Nun haben sich auch Kandidaten aus China und Korea angekündigt: ziemlich spannend. Mit einem begeisternden Preisträger-Konzert ging der 5. Europ. Jugendwettbewerb für Gitarre in Velbert zu Ende. Heinz-Jürgen Küpper, ehemaliger Leiter der Musik- und Kunstschule, moderierte sachkundig und humorvoll den Abend. Bürgermeister Stefan Freitag bezeichnete den Wettbewerb als "fruchtbar für Velbert, für Deutschland und Europa". Er dankte allen, die zum Gelingen beigetragen hatten: der Jury und den Organisatoren, den Sponsoren und den Mitspielern. Die weiteren Redner: Martin Maria Krüger, Präsident des Deutschen Musikrates, Prof. Alfred Eickholt, Präsident der Gitarren-Lehrer-Vereinigung (EGTA), und Jörg Buschmann, Vors. der Sparkasse HRV - sie alle waren sich über den großen Wert des Wettbewerbes für die Jugendlichen einig. Denn diese waren von der Jury nicht nur "benotet", sondern für ihr Fortkommen beraten worden, unabhängig vom Ergebnis. Und schon begann das hervorragende Musizieren der jüngsten Altersgruppe: Niels Pfeffer (Deutschland) mit dem 3. Preis ein Prélude aus einer Bach-Suite; Tuur Segers (Belgien) mit einem 1. Preis eine rhythmisch energische Fandangillo und Lovro Peretic (Kroatien), ebenfalls mit einem 1. Preis, das schwierige "En los Trigales". Auch diese Jüngsten spielten, wie später die Älteren, alle Stücke auswendig - trotz anspruchsvoller Konstruktionen. In der 2. Altersgruppe boten die 14- bis 16-Jährigen Werke mit musikalischen und sogar virtuosen Ansprüchen: Vilmos Haraszti (Ungarn), 3. Preis, erhielt wegen seiner witzigen Variationen zum "Carnaval des Venice" den größten Beifall. Erste Preise erhielten Samuel Toro Perez (Österreich) und Juraj Majstorovic (Kroatien): Beide erfreuten mit musikalisch hochdifferenzierten Werken, glänzend gekonnt. Die Altersgruppe 3 der über 16-Jährigen eröffnete Bogdan Mihailescu (Rumänien) mit differenzierten Variationen über ein anatolisches Volkslied (3. Preis). Den 2. Preis erzielte Katrzyna Milczarek (Polen). Sie spielte einen virtuos-heiteren Sonatinensatz von Torroba. Den 1. Preis errang verdient Ihar Dzedusenka (Weißrussland). Er bezauberte durch gewandtes Spiel mit Werken von Walton und Vassiliew. Den Sonderpreis der EGTA für das bestgespielte moderne Werk erhielt Jakob Schmidt (Deutschland). Drei Meistergitarren der Firma Höfner gingen an drei würdige Mitspieler. Die von Baumeister Constantin Dumitriu gespendete Qualitätsgitarre erhielt Ihar Dzedusenka, der sie gleich ausprobieren musste. Velbert kann stolz sein: Zum vierten Mal fand hier der Europäische Jugendwettbewerb für Gitarre «Andrés Segovia» statt. Der musikalische und musikpädagogische Wert und der menschliche bei der Begegnung von 70 jungen Gitarristen aus vielen europäischen Ländern ist kaum zu überschätzen. Auch Bürgermeister Stefan Freitag war in seiner Begrüßung hoch erfreut und versicherte: "In zwei Jahren ist der nächste Wettbewerb in Velbert gesichert." 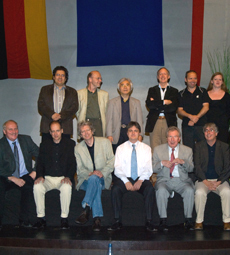 Er dankte allen Initiatoren, Sponsoren und Mitwirkenden, besonders Prof. Alfred Eickholt, dem Vorsitzenden der EGTA, Heinz Jürgen Küpper, dem Leiter der Musik- und Kunstschule und Giselher Jung, dem Leiter der Velberter Gitarrenklassen. Hein Sanderink, Präsident der EGTA (NL), ging in seiner Ansprache auf den menschlichen und geistigen Wert des Musizierens ein: "Üben macht Freude." Prof. Eickholt: "Es gibt nichts Schöneres, als junge Leute musikalisch zu fördern", und bedankte sich bei den Helfern. Von den Preisgewinnern in jeder Gruppe gestalteten die Gewinner der drei ersten Preise das Konzert. Schon die jüngsten Gitarristen der Altersgruppe I (bis 13 Jahre) spielten technisch und musikalisch einwandfrei und mit Spaß: Jurei Majstorovic (Kroatien) das freundliche "La Milanese" von Kleynjans, Andreja Puskas (Kroatien) und Ana-Maria Iordache (Rumänien), beide Gewinnerinnen des ersten Preises, spielten die schon technisch schwierigen Stücke "La Negra" und "Carora" von Lauro. Der Bürgermeister verlieh die Preise. 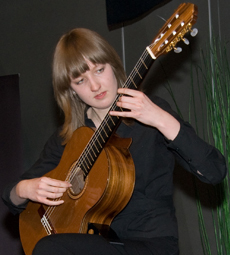 Todor Manojlovis und Niels Pfeffer (Deutschland) erhielten je eine Meistergitarre der Firma Höffner, Andreja Puskas erhielt eine Einladung zum Spiel beim Bayerischen Rundfunk (BR). 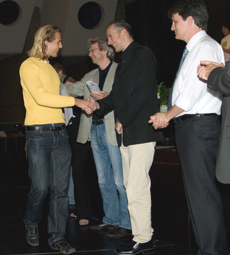 Von der Altersgruppe II (14 bis 16 Jahre) musizierten Georg Stettinger (Österreich), Mircea-Stefan Gogoncea und Rado Stefan Valcu (beide aus Rumänien) und mit dem ersten Preis Igor Dzedusenka (Weißrussland). Ihre Stücke von Berkeley, Rodrigo, Mangore und Mertz forderten neben der Technik schon gutes Eingehen auf den Ausdruck der Stücke. Jörg Buschmann verlieh hier als Direktor des Hauptsponsors, der Sparkasse, die Preise. 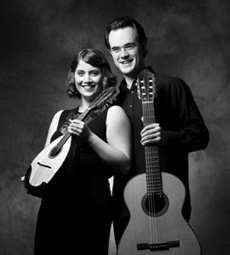 Alina Elena Ciolacu (Rumänien) und Tomasz Fechner (Polen) erhielten die gespendeten Höffner-Gitarren. Igor Dzedusenka erhielt die Einladung vom BR. In der Altersgruppe III (17 bis 19 Jahre) wurde schon fast profihaft gut und ausdrucksvoll gespielt: Victor Ilic (Serbien/Montenegro), Sanel Redzic (Bosnien-Herzegowina) und der viel umjubelte Michal Bak (Polen), erster Preisträger, der sogar eine Zugabe spielen musste. Sie meisterten die höchst anspruchsvollen Werke von Legnani, Mertz und Dyens hervorragend. Karoline Kunst (Deutschland) erhielt für eine moderne Jazz-Sonate den EGTA-Preis. Michal Bak wurde vom BR zum Vorspiel eingeladen. 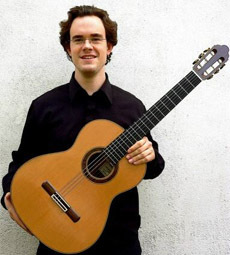 Sanel Redzic erhielt eine Meistergitarre des rumänischen Gitarrenbaumeisters Constantin Dumitriu. Beim Abschlusskonzert im Forum Niederberg bewiesen die jungen Preisträger des vierten Gitarrenwettbewerbs «Andrés Segovia» ihr hohes Niveau. Igor Dzedusenka aus Weißrussland atmet tief ein. Sanft beginnen seine Finger über die Saiten seiner Gitarre zu gleiten. Plötzlich scheint er die vielen Zuhörer nicht mehr zu bemerken. Mit seinem intensiven Spiel schafft es der junge Musiker, sich selbst und sein Publikum in eine andere Welt zu zaubern. Erst bei dem gebührenden Applaus kehrt langsam die Realität zurück. 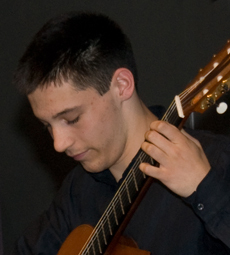 Igor Dzedusenka ist einer von elf Jugendlichen, die es beim vierten Europäischen Jugendwettbewerb für Gitarre «Andrés Segovia» am Samstag im Forum Niederberg auf das Siegertreppchen schafften. Rund 80 Teilnehmer aus 13 Ländern versuchten mit ihrem Talent die Jury zu überzeugen. Gespielt wurde in drei Altersgruppen: Jugendliche bis13 Jahre, 14- bis 16-Jährige und 17- bis 19-Jährige traten gegeneinander an. Neben fünf Geldpreisen je Altersstufe waren als Sachpreise Meistergitarren und Notenausgaben, aber auch Stipendien zum Besuch von Kursen und Meisterklassen als Fördermaßnahme ausgelobt. Am Abend gab es dann das überzeugende Konzert der Sieger. "Wir dürfen die talentiertesten Gitarristen Europas erwarten", versicherte Professor Alfred Eickholt. Der Vorsitzende der deutschen Sektion der Europäischen Gitarrenlehrer-Vereinigung betonte das hohe Niveau der jungen Musiker, die ihre Chancen bei der Bewerbung anhand des Schwierigkeitsgrades einiger Stücke selber einordnen konnten. Auch unterstrich Eickholt die Wertschätzung des Wettbewerbs weit über die deutschen Grenzen hinaus. Mit drei Preisträgern war die starke rumänische "Mannschaft" im Wettbewerb am erfolgreichsten, gefolgt von Russland und Kroatien jeweils mit zwei jungen Musikern. Auch vertreten waren beim Preisträgerkonzert Österreich, Weißrussland, Serbien, Bosnien-Herzegowina und Polen. Dementsprechend vielfältig war auch das Programm: Ob Stücke von Francis Kleynjans, Antonio Lauro oder Johann Kasper Mertz - die Internationalität war nicht zu überhören. Bürgermeister Stefan Freitag formulierte seine Bewunderung für die Leistungen der Teilnehmer: "Die Musiker überzeugen uns heute Abend mit beträchtlichem Talent. Das heißt aber nicht, dass Talent zugeflogen kommt. Hinter diesem Gitarrenspielen steckt unheimlich viel Arbeit. Und trotzdem ist die Freude, die ihnen die Musik bereitet, nicht zu übersehen." 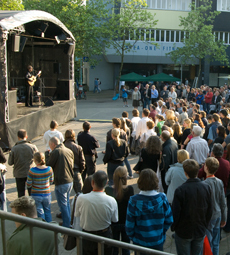 Freude und Begeisterung zeigte auch das Publikum, womit sich das Forum Niederberg wieder einmal als zugkräftiger Kulturplatz erwiesen hatte - und das an diesem Abend auf ganzer internationaler Ebene. Die ersten Plätze in den drei Altersgruppen belegten: Ana-Maria Iordache (Rumänien), Andreja Puskas (Kroatien), Igor Dzedusenka (Weißrussland), und bei den 17- bis 19-Jährigen Michal Bak (Polen). Heute geht es los: 75 Jugendliche aus ganz Europa treten in verschiedenen Altersklassen gegeneinander an - mit der Gitarre. Bereits zum vierten Mal findet in diesem Jahr der Jugend-Gitarrenwettbewerb «Andrés Segovia» hier in Velbert statt. "Wir haben die Elite zu Gast. Die Teilnehmer gehören in ihren Ländern zu den Besten der Besten", freut sich Heinz Jürgen Küpper, Leiter der Musikschule und Organisator des Festivals. Die ersten Gäste sind schon am Dienstag in Velbert angekommen. Sieben rumänische Schüler mit ihren Lehrern und einem Gitarrenbauer landeten im strömenden Regen in Düsseldorf. "Zu Hause sind wir bei 30 Grad und Sonne losgeflogen, Hier ist es kalt und nass. Ist das immer so?" Die Frage richtete sich an Heinz Jürgen Küpper. Dem blieb aber nichts als ein Achselzucken. "Letzte Woche war es noch schön". Für Professor Liviu Georgescu, Mitglied der Jury und selbst Organisator eines großen Gitarren-Festivals in Rumänien, ist das Wetter hingegen eigentlich gar nicht so schlecht. "Dann können meine Schüler mehr üben und sind nicht so abgelenkt", sagt er lachend. Zwar wollen sie eigentlich nur Gitarre spielen und Spaß haben, aber "natürlich will ich auch gewinnen, wenn ich an so einem Wettbewerb teilnehme", sagt Mircea Gogoncea. Er ist gerade einmal vierzehn Jahre alt, aber eigentlich schon ein alter Hase. Allein in Velbert ist er schon zum dritten Mal dabei, hat auch schon gewonnen. Und sollte der Erfolg doch ausbleiben, ist das für ihn und seinen Lehrer kein Problem. "Dann können wir das als gute Erfahrung mitnehmen und wissen, dass wir für den nächsten Wettbewerb mehr tun müssen", meint Georgescu. Allerdings werden die Musiker nicht nur mit ihren Gitarren beschäftigt sein. "Nach dem Wettbewerb wollen wir uns die Stadt und die Umgebung schon noch ein bisschen genauer ansehen", sagt Mihaela-Oana Iordache. Sie ist zum ersten Mal bei einem Festival im Ausland dabei und fiebert dem Ereignis entgegen: "Klar bin ich auch ein wenig aufgeregt. Das gehört doch dazu. Aber wir alle freuen uns jetzt schon auf den Auftritt." Äußerlich ganz gelassen und mit fast schon professionellen Routine traten einige Teilnehmer beim diesjährigen Gitarrenwettbewerb im Forum auf. Hinter den Kulissen ging es jedoch nicht immer so ruhig zu: Mal musste der Vater dem kleinen Sprössling bis kurz vor dem Auftritt die Hände wärmen, ein anderes Mal begleitete das Kuscheltier einen der jüngeren Musiker bis in den Einspielraum. Dorthin wurde jeder Teilnehmer 45 Minuten vor dem Wertungsspiel vom Personal des Wettbewerbsbüros gebracht. Doch nicht allen reichte diese Dreiviertelstunde zur Vorbereitung: Schon lange vor Beginn des Wettbewerbs am Donnerstagmorgen übten einige Teilnehmer im Theatersaal und im großen Saal des Forums. "Vor dem Wettbewerb war ich doch ziemlich nervös", gestand Samuel Toro-Perez aus Österreich. "Aber als ich dann auf der Bühne saß, war ich ganz ruhig". Ruhe und Gelassenheit waren für seinen Vater an diesem Tag jedoch Fremdworte. "Ich glaube, ich war nervöser als mein Sohn, wobei ich damit doch gar nichts zu tun hatte". Die gleiche Erfahrung mussten auch die Eltern von Luc Mata aus Frankreich machen. Hier war die Aufregung sogar so stark, dass die Mutter gar nicht ihren Sohn sehen wollte, während er spielte, "ich habe aber dann doch die ganze Zeit vor der Tür gestanden und gelauscht". Die französische Familie aus dem Dorf Presles, das nahe bei Paris liegt, war am Mittwoch nach sechsstündiger Autofahrt in Velbert angekommen und begeistert: "Die Organisation hier ist perfekt, die Stadt ist so sauber und auch die Landschaft ist sehr schön". Einer besonderen Herausforderung musste sich gestern Jan Raithel aus Bayern stellen: Nachdem der 13-Jährige gerade sein Programm der Jury vorgespielt hatte, stand auf einmal ein Kamerateam vom Fernsehen im Saal und bat ihn, sein Lieblingsstück noch einmal zum Besten zu geben. "Ich war ja schon aufgeregt, als nur die Jury zugehört hat; aber als das Fernsehen kam, war ich richtig nervös", gestand Jan. "Die Aufnahmen dauerten ziemlich lange, und als ich das Stück dann zum fünften Mal spielen sollte, wurde mir fast langweilig dabei", gab der Nachwuchsmusiker zu und erhielt direkt einen bösen Blick von seinem Gitarrenlehrer, der das Stück komponiert hat; doch in seiner Erleichterung bemerkte er das gar nicht. Angstschweiß, kalte Hände, nervöse Eltern und professionelle Musiker wird es auch heute Abend wieder geben, wenn um 20 Uhr die Preisträger ihr Bestes geben. Rundum gelungen war der Zweite Europäische Jugendwettbewerb für Gitarre «Andrés Segovia». Für Organisatoren und Teilnehmer hagelte es Komplimente seitens der Jurymitglieder. Die Mühen der vergangenen Monate hatten sich gelohnt, das wussten die Organisatoren des Zweiten Jugendwettbewerbes für Gitarre bereits, als die ersten Takte gespielt waren. Zwar hatte man die Pflichtstücke etwas höher angesetzt als beim vergangenen Mal vor zwei Jahren, aber die Fähigkeiten der jungen Gitarristen versetzten selbst die Jury ins Staunen. "Vor allem über die Altersgruppe 1 herrschte Sprachlosigkeit", beschreibt Heinz Jürgen Küpper, Leiter der Musik- und Kunstschule, die Reaktion der Jurymitglieder. Dabei haben letztere schon viel gesehen: Namen wie Konrad Ragossnig oder Costas Cotsiolis lassen Kennerherzen höher schlagen. "Vor diesen Menschen spielen zu dürfen empfindet der Nachwuchs als große Ehre", so Küpper. Entsprechend groß war die Aufregung bei den Teilnehmern. Von den 91 Angemeldeten konnten 84 tatsächlich nach Velbert kommen. Diesmal wurden sie alle im Jugendgästehaus untergebracht. Aus Velbert war diesesmal keiner dabei. Mehrere Geld- und Sachpreise waren zu vergeben, und die Jury tat sich reichlich schwer damit, denn "es ist sehr eng da oben", meint Heinz Jürgen Küpper. Begeisternd hohes Niveau beim Preisträgerkonzert des Europäischen Jugendwettbewerbs für Gitarre «Andrés Segovia» im Forum: Die jungen Musiker rissen das sachkundige Publikum zu Beifallsstürmen hin. Stv. Bürgermeister Klaus Mühlhoff dankte den Sponsoren sowie der Jury und gab seiner Freude Ausdruck, dass Velbert durch den großen Erfolg auch des zweiten Wettbewerb zu einem Begriff in ganz Europa geworden sei. Prof. Alfred Eickholt, 1. 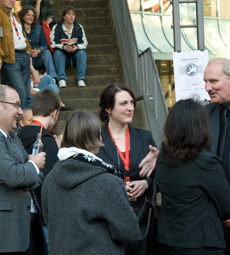 Vorsitzender des deutschen EGTA-Sektion, dankte der Jury und allen Helfern, insbesondere dem Organisator Giselher Jung. Gleichzeitig rief er zur Unterstützung junger Menschen auf, die sich den Künsten widmen: "Die Welt wäre um vieles ärmer, wenn wir das nicht mehr täten." Mit den Worten "Nach der Pflicht nun die Kür" leitete Heinz-Jürgen Küpper, Chef der Velberter Musikschule, das Konzert der Preisträger ein, das mit dem Auftritt der jüngsten Altersgruppe begann. Alle spielten ihre schon anspruchsvollen Stücke auswendig, technisch einwandfrei und musikalisch: Ann Lihachova aus Russland (5. Preis), Luca Stan-Sion aus Rumänien (3. Preis), Marko Ferlan aus Slowenien (2. Preis) und Mircea-Stefan Gogoncea aus Rumänien (1. Preis). Onesi Terterashvili (St. Petersburg), der den 4. Preis errang, spielte unbekümmert um die lange Wartezeit sein Stück ganz am Schluss. Überraschend gut war auch das Spiel der 14- bis 16-jährigen Teilnehmer mit anspruchsvollen Werken von Bach bis Piazzola, wobei man spürte, wie sich jeder vorher auf sein Stück und sein Instrument konzentierte: Ines Thomé aus Bad Vilbel (5. 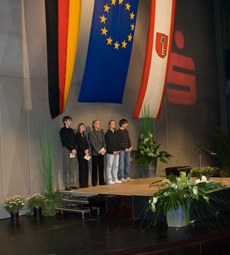 Preis), Michal Bak (Polen) und Matthias Müller (Solingen), die sich den dritten Preis teilten, Eliska Balabanova (Tschechien) und Srdan Bulat (Kroatien), die gemeinsam den ersten Preis errangen. Alle zeigten schon wachsende musikalische Sensibilität und technische Reife. Auf fast professionellem Niveau spielten die Preisträger der höchsten Altersgruppe (17 bis 19 Jahre) auf: Dimitry Rodichev aus Russland (3. Preis), Matej Freml/Tschechien (2. Preis) und Stanislav Hvartschilkov/Bulgarien (1. Preis). Gleichsam eins mit ihrer Gitarre, spielten sie nicht nur virtuos ihre schwierigen Stücke von Paganini, Piazzolla und Guiliani, sondern interpretierten überzeugend Form, Stil und musikalischen Ausdruck der Werke. Den EGTA-Preis für das Spiel des nach 1950 komponierten modernsten Stücks gewann Marlon Leon Titre aus den Niederlanden mit der Interpretation von Henzes "Drei Tentos". Die von den Gitarrenbauern Giannis Paleodimopoulos (Griechenland) und Bernd Holzgruber (Österreich) gestifteten Gitarren gewannen Srdan Bulat und Dimitry Rodichev. Sie führten ihre neuen Instrumente gleich vor. Der Name Velbert hat in der Welt der Gitarristen einen guten Ruf: Der Europäische Jugendwettbewerb für Gitarre «Andrés Segovia» ist bereits - obwohl erst zum zweiten Mal mit großem Engagement durchgeführt - eine feste Größe geworden. Den außerordentlichen Erfolg der Premiere vor zwei Jahren beweisen neben der wieder hochkarätig besetzten Jury auch die vielen Teilnehmer, die erneut ihr Können unter Beweis stellen. Zur Eröffnung am frühen Mittwochabend geben sie sich ein Stelldichein im Foyer des Forums Niederberg. 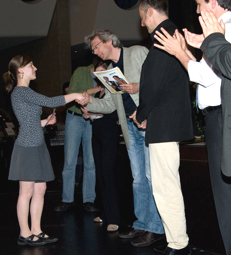 Die Preisträger des Jahres 2000 schlendern noch ganz locker von Tür zu Tür - die Gewinnerin der Altersgruppe 1, Eliska Balabánová, in Begleitung ihrer Mutter, der Dritte der Altersgruppe 2, Dimitry Rodichev, ganz allein im beigefarbenen Anzug. Nervosität ist erst für die kommenden Tage angesagt. Entspannt folgen die rund 80 Teilnehmer aus 15 Nationen den Beiträgen der Eröffnungsfeier, die vom Musikschul-Orchester und der Choreographischen Werkstatt gestaltet wird. Lateinamerikanische Tänze bieten die jungen Musiker unter Leitung von Klaus Hayens, modernen Tanz die sechs jungen Frauen, einstudiert von Gabriele Voigt. Ein schöner Rahmen für die Ansprachen von Bürgermeister Hanns-Friedrich Hörr und dem Vorsitzenden der deutschen EGTA-Sektion und Jury-Mitglied, Prof. Alfred Eickholt. Als "für kurze Zeit das gitarristische Zentrum Europas" bezeichnet ein sichtlich stolzer Bürgermeister "seine" Stadt und versäumt nicht, allen Teilnehmern viel Glück zu wünschen. Eickholt übermittelt die Grüße der Marquesa Emilia Segovia, der Witwe des großen Gitarren-Künstlers: "Mein Herz ist an diesen Tagen in Velbert." Und schließlich gibt's vorweg ein Kompliment an die Teilnehmer. "Ich bin sicher, dass der ein oder andere schon bald auch auf anderen Podien zu hören ist", prophezeit Eickholt. Ob der 16-jährige Herner Gregor Sklarsky dazugehört, wird sich noch herausstellen. Zumindest scheint er Nerven wie Drahtseile zu haben, als er am frühen Donnerstagnachmittag den Vorspielraum der Altersgruppe 2 im Queens-Hotel betritt, seelenruhig sein Fußbänkchen entfaltet und auf dem Klavierhocker Platz nimmt. Konzentriert beginnt er mit einem Bach-Präludium, sorgsam die Finger der linken Hand beobachtend. Im Blick haben ihn die drei Juroren: Sonja Prunnbauer aufmerksam vorgebeugt, Liviu Georgescu regungslos und Carlo Marchione entspannt zurückgelehnt, den Stift für die Notizen in der linken Hand. In der ersten Reihe sitzen Familie und Freunde, die Daumen drückend. Bei Onesi Terterashvili, der im großen Saal des Forums vor die Jury tritt, ist es nur der Vater, der den zwölfjährigen Russen fast bis aufs Podium begleitet. Mit schwarzem Anzug, weißem Hemd und lila Schlips hat sich der St. Petersburger herausgeputzt, der sein Vorspiel in der Altersgruppe 1 schon sehr professionell absolviert und Juroren sowie Publikum mit einer Verbeugung begrüßt. Dass selbst bei den Jüngsten hohes Können gefragt ist, zeigt bereits die Auswahl des Pflichtstücks: Federico Moreno Torrobas "Albada" aus "Pièce caractéristiques" fordert Tempo, abwechslungsreiche Dynamik und Einfühlungsvermögen bei etlichen Stimmungswechseln - für Terterashvili offensichtlich kein Problem. Was die Juroren Silfredo Pérez, Raphaella Smits und Hein Sanderink davon halten, wird der Junge heute Nachmittag erfahren. Echte Profis sind in der Altersgruppe 3 am Werk, wie der 18-jährige Stanislav Hvartschilkov beweist. Nicht nur, dass er sein Instrument im Wortsinne im Griff hat und die ganze Bandbreite zwischen zart-leise und zupackend-laut zeigt. Er zeigt auch, was den Jüngeren noch fehlte: Die Kombination von Musik und Bewegung, das Mitgehen bei Melodien, den Gesichtsausdruck, als spiele er nur für sich. Die Jury ist in diesen Momenten ganz weit weg - und wohl angetan. Ein leichtes Lächeln liegt Monika Rost und Konrad Ragossnig auf den Lippen, und selbst dem sonst eher streng blickenden Alfred Eickholt entlockt die musikalische Miniatur zum Schluss - Julio Sagreras' "El colibri" - ein deutliches Grinsen. "Velbert", weiß Gîselher Jung, "wird wieder zum Zentrum des europäischen Gitarren-Nachwuchses - auf höchstem Niveau." 91 Jung-Musiker aus 15 Nationen spielen ab Donnerstag auf - bei der zweiten Auflage des europäischen Jugendwettbewerbs für Gittarre, «Andrés Segovia». 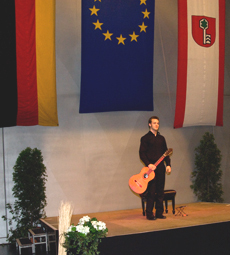 Noch heute, zwei Jahre nach der Premiere, schwärmt Jung, Fachbereichsleiter Gitarre der Musik- und Kunstschule und zuständig für die Organisation, von der besonderen Note des größten europäischen Wettbewerbs dieser Art: "Gitarre und Velbert - das ist weltweit ein Gütesiegel", sagt Jung. 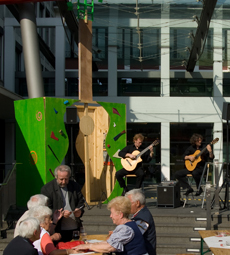 So gelang es der Stadt, in Kooperation mit der "European Guitar Teachers Association/Sektion Deutschland (EGTA)" Veranstalter des Festivals, die "Gitarren-Jugend Europas in Velbert zu versammeln". Den Teilnehmern ist kein Weg zu weit, um dabei zu sein; um einen kleinen Karriere-Schritt zu meistern und vielleicht selbst mal so berühmt zu werden wie der spanische Jahrhundert-Gitarrist Andrés Segovia, dessen Witwe Schirmherrin ist. Strapazen nehmen die Talente dafür auf sich wie der junge Russe, der sich bereits gestern in Saratov in den Bus setzte: Nach 3000 km und vier Tagen wird er Montag Quartier beziehen im Velberter Jugendgästehaus, wo sich die meisten Teilnehmer kennen lernen - oder wieder sehen, denn viele Solisten waren schon bei der Premiere dabei. Und begeisterten vor zwei Jahren Experten aus der ganzen Welt - wie Gitarrenbaumeister Bernd Holzgruber, der nun eine wertvolle Gitarre als Sonderpreis stiftete. Ebenso wie sein griechischer "Kollege" Giannis Paleodimopoulos. Insgesamt können die Teilnehmer - eingeteilt in drei Altersklassen (bis 13 Jahre, 14 bis 16 und 17 bis 19 Jahre) - Preise im Wert von 20 000 Euro gewinnen. Zudem vergeben die Juroren - renommierte Künstler und Pädagogen aus neun Ländern - fünf Stipendien. Nach dem Erfolg des 1. Europäischen Jugendwettbewerbs für Gitarre «And­rés Segovia», der vor 2 Jahren in Kooperation der Stadt Velbert, vertreten durch die Musik- und Kunstschule, und der "European Guitar Teachers Association" (EGTA) jugendliche Gitarristen aus ganz Europa zum internationalen Vergleich nach Velbert holte, geht es nun in die zweite Runde. Vom 29. Mal bis zum 1. Juni 2002 messen sich vielversprechende junge Musiker im friedlichen Wettstreit, der mit dem Gedanken der Verständigung unter den Völkern und Nationen auf Basis der Musik verbunden ist. Als im Jahr 2000 die Organisatoren den Wettbewerb für junge Gitarristen zum ersten Mal europaweit ausschrieben, kamen trotz der vorgegebenen Begrenzung auf den Kontinent sogar aus Japan und den USA Bewerbungen, so attraktiv war die Veranstaltung schon damals. «Andres Segovia», benannt nach dem legendären spanischen Gitarrenvirtuosen und unter der Schirmherrschaft seiner Witwe, der Marquesa Emilia Segovia stehend, ist es der erste Wettbewerb seiner Art überhaupt und daher Wegbereiter und internationales Beispiel für die gesamte Fachwelt. Die Stadt Velbert kann sich dank der Planung und Ausrichtung durch die Musik- und Kunstschule unter Heinz J. Küpper auf ihre Fahnen schreiben, damit zum europäischen Mekka junger Gitarristen geworden zu sein. Maßgeblichen Anteil am Gelingen wird auch diesmal die EGTA durch ihren deutschen Vertreter Alfred Eickholt und seine Studenten von der Musikhochschule Wuppertal haben. Dass Velbert tatsächlich auf Anhieb zum Traumziel junger Gitarristen geworden ist, lässt sich schon ladurch belegen, dass die 3 Wettbewerbsgruppen (bis 13 Jahre, 14 bis 16 Jahre und 17 bis 19 Jahre) bereits vor Ende der Anmeldefrist komplett besetzt waren und viele Bewerbungen abgelehnt werden mussten. Koordinator Giselher Jung, in dessen Händen auch schon die Organisation im Jahr 2000 lag, freut sich über den Zuspruch von 37 deutschen Teilnehmern und 54 Kandidaten aus 14 europäischen Ländern, aus deren Kreis nach Pflicht- und freiem Programm nach 3 Tagen die Sieger gekürt werden. Die weiteste Anreise wird der 16-jährige Vassili Bigus aus Norilsk, jenseits des russischen Polarkreises haben. Allein die Beschaffung eines Visums aus dem rund 4.000 Kilometer entfernten Moskau ist mühselig und teuer. Vielleicht findet sich ja dafür ein Sponsor. Die nähere Region ist mit Teilnehmern aus Wermelskirchen und Solingen vertreten. Auch die Fachjury ist wieder hochkarätig und international besetzt. Genau wie beim ersten Mal, nur reicher um die gewonnene Erfahrung, wird der Wettbewerb erneut zum Festival für die ganze Stadt Velbert samt Nachbarstädten und dem niederbergischen Raum. Alle Wertungskonzerte im Velberter "Forum Niederberg" und im "Queens Park Hotel" sind öffentlich und kostenlos. Dieses Angebot wurde bei der ersten Austragung sehr intensiv vom Publikum wahrgenommen, und es lohnte sich, denn bereits die Vorausscheidungen sind von hoher musikalischer und technischer Qualität. Aber auch die Begegnung mit den jungen Talenten, das Gespräch und praktizierte Gastfreundschaft werden, wie die Erfahrung zeigt, wichtiger Bestandteil der 4 Tage sein, die Velbert in den Focus der Musikwelt rücken. Gemessen am persönlichen Einsatz und Aufwand der Teilnehmer, vor allem derer mit weiter Anreise, haben die ausgesetzten 15 Geldpreise von insgesamt 7.500 Euro einen eher symbolischen Charakter. Umso deutlicher wird dadurch das Engagement und der Wunsch der Bewerber, dabei zu sein. Besonders reizvoll erscheint die zusätzliche Vergabe von Förderpreisen für Interpretationen zeitgenössischer Kompositionen sowie von Stipendien für Meisterkurse. Und auf die Sonderpreise in Form von je einer Gitarre aus den Meisterwerkstätten von Bernd Holzgruber (Österreich) und Giannis Paleodimopoulos (Griechenland) dürfte der Blick aller Wettbewerber gerichtet sein. Höhepunkte des Rahmenprogramms werden nach dem Festakt zur Eröffnung am 29. Mai die Virtuosen-Konzerte am 30. Mai mit Costas Cotsiolis und am 31. Mai mit dem Amadeus Guitar Duo (Dale Kavanagh/ Thomas Kirchhoff) und mit der Thüringer Philharmonie, sowie das Preisträger-Konzert am 1. Juni, jeweils um 20 Uhr im Forum Niederberg, Oststraße 20, sein. Karten gibt es bei der Velbert Marketing GmbH unter Telefon (02051) 316510. Weitere Informationen gibt es im Internet unter www.gitarrevelbert.de. 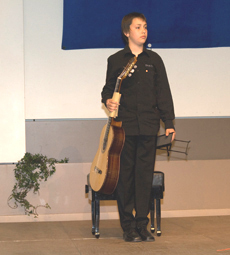 Einen fantastischen zweiten Platz machte der Velberter Fabian Hinsche beim "Ersten Europäischen Jugendwettbewerb für Gitarre" in seiner Heimatstadt. Dem Stadt Anzeiger erzählte der Pennäler von seinem Leben mit der Gitarre. Gerade erst war Fabian Hinsche ebenfalls mit einem zweiten Platz vom Bundeswettbewerb "Jugend musiziert" in Berlin zurückgekehrt - nicht sein erster Erfolg bei diesem nationalen Wettbewerb. Trotz all seiner Erfolge und in bezug auf diese, erwähnt der frisch gekürte "Europa Vize" nie das Wort Talent. Stolz, eiserne Disziplin, "es war mir eine hohe Ehre, dort teilnehmen zu dürfen", heißt es im Gespräch nur immer wieder. Keine Spur von Star Allüren. Hinsche genießt seine Erfolge auf ganz andere Art und Weise. Aus den Wettbewerben erntet er für sich immer "nur" mehr Ehrgeiz, ohne dabei eitel zu sein: "Bei so einem Wettbewerb kann alles einen motivieren, noch besser zu werden: ob es nun ein Lob ist, oder im Finale zu sein, und dann doch keinen Preis zu machen. Die Leistung des anderen muß dabei immer respektiert werden". Auf den Lorbeeren ausruhen,und sei es nur mental ist also nicht drin. Schon gar nicht bei dieser immer besser werdenden Konkurrenz. Doch trotz seines Mindest-Tagespensums von zwei Übungsstunden spricht der"Fast-Profi" auch hier nie von einem Leben voller Entbehrungen, wie so manch anderer: "Natürlich" bleibt da immer noch Zeit für Hobbies und Freunde. "Nebenbei" schwingt Fabian Hinsche auch noch regelmäßig den Badminton Schläger und lernt schon mal eifrig Cello, um zum Musikstudium zugelassen zu werden: "Ich möchte nach dem Abitur Musik studieren und dann später vielleicht auch als Dozent an einer Hochschule bleiben". Vorher aber müssen noch viele Übungsstunden ins Land gehen. Aufhören zu lernen, tue man als Gitarrist ohnehin nie. Wer die Gitarre nicht mehr aus seinem Leben rausdenken kann, dem können auch die langweiligen Sprüche der Mitschüler nichts anhaben: "Die Kommentare interessieren mich wirklich nicht mehr. Immerhin steht die Lehrerschaft hinter mir. Aber ein Sonderling bleibt man schon noch. Deswegen genieße ich die ganze Atmosphäre, all die Leute, die davon Ahnung haben, um mich herum zu haben, das ganze Drum-Herum eben auf den Wettbewerben. Auch das gibt mir sehr viel Ehrgeiz. Deswegen sehe ich so einen Wettbewerb eher als Kurs an". Als 19jähriger hat Hinsche am Velberter Wettbewerb zum ersten und leider auch schon letzten Mal teilgenommen. Demnächst wird man ihn dann auf Profi-Veranstaltungen sehen können, oder unter den Zuschauern des "Zweiten Europäischen Jugendwettbewerbs für Gitarre". Positiv fiel in der abschließenden Pressekonferenz das Resümee zum ersten Europäischen Jugendwettbewerb für Gitarre Andrés Segovia aus. Die hochgesteckten Ziele wurden weit übertroffen. 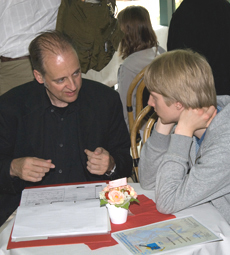 Einen unglaublichen Erfolg nannte Alfred Eickholt, Vorsitzender der Jury und der deutschen Sektion der European Guitar Teachers Association (EGTA), den Wettbewerb. Zwar war bereits vorher klar, dass alle zwei Jahre in Velbert musiziert werden soll, aber nun denken die Veranstalter daran, den Wettbewerb noch zu vergrößern. Der Grund: Die drei Tage reichten zwar für die rund 90 Teilnehmer aus, allerdings gab es im Vorfeld weit über 100 Bewerbungen. Besonders gefreut habe die Organisatoren - neben Eickholt von der Musik- und Kunstschule Heinz-Jürgen Küpper und Giselher Jung - die große Resonanz bei den Zuhörern. Sowohl die Konzerte von Michael Langer und Eliot Fisk als auch die Vorspiele der jungen Gitarristen waren gut besucht. Beim Finale der Altersstufe 3 sei der Saal fast zu klein gewesen. Selbst die Juroren, die viele andere Wettbewerbe und Festivals kennen, seien begeistert gewesen: vom ausnahmslos hohen Niveau der Teilnehmer, der perfekten Organisation und der angenehmen Atmosphäre in Velbert. Dass Künstler dieses Rangs zu einem neuen Wettbewerb kommen, noch dazu für Jugendliche, ist gar nicht selbstverständlich, erklärte Küpper. Die Juroren waren sehr zufrieden - dann kommen auch beim nächsten Mal hervorragende Leute. Dafür wird wohl auch die Schirmherrin und Witwe Segovias sorgen, die Marquesa Emilia Segovia. Sie war gerührt und fühlte sich in Velbert wohl, so Küpper. Das war sicher ein Grund dafür, dass sie sich spontan zur Stiftung eines Preises bereit erklärte. Für Zakhar Liakhov, der extra vom Baikalsee angereist war und auf einer schlechten Gitarre gut spielte, kaufte die Marquesa noch am letzten Tag ein hochwertiges Instrument, das sie dem jungen Russen beim Preisträgerkonzert übergab. Erfreulich übrigens das Abschneiden der Velberter Teilnehmer: Vicente Mozos del Campo und Fabian Hinsche schafften es bis in die Finalrunde und wurden in die höchste Leistungsgruppe eingestuft. Fabian Hinsche erhielt sogar den zweiten Preis. Die Ergebnisse: Altersstufe 1: 1.Preis Eliska Balabanova (Tschechien), 2.Preise Mak Grgic (Slowenien) und Petar Culic (Kroatien), 3.Preis Florian Palier (Österreich), 4.Preis Janko Raseta (Polen), 5.Preis Julian Schmidt (Deutschland). Alterstufe 2: 1.Preis Branko Pralica (Kroatien), 2.Preis Reinhard Glätzle (Österreich), 3.Preise Tristan Angenendt (Deutschland) und Maud Laforest (Frankreich), 4.Preis Fabian Freesen (Deutschland), 5.Preis Dima Rodichev (Russland). Altersstufe 3: 1.Preis Boris Tesic (Bosnien-Herzegowina), 2.Preis Fabian Hinsche (Deutschland), 3.Preis Matej Freml (Tschechien), 4.Preis Takeo Sato (Deutschland), 5.Preise Nicole Kürschner (Deutschland) und Alan Metelko (Kroatien). Sonderpreis der EGTA: Christoph Weisbrod (Deutschland). In atemloser Spannung lauschten die Zuhörer im dicht gefüllten Kongress-Saal des Forums der faszinierenden Gitarrenmusik von Eliot Fisk. Das Spiel des amerikanischen Künstlers hat Weltniveau. Die Witwe von Andrés Segovia, dem der Gitarren-Wettbewerb in Velbert gewidmet ist, war anwesend. Eliot Fisk, Schüler und Freund Segovias, sprach zu ihr in spanischer Sprache über das Verhältnis von Lehrer und Schüler am Beispiel von J.S. Bach und seines Sohnes Philipp Emanuel: Hochachtung und notwendige Weiter-Entwicklung begegnen sich hier auf fruchtbare Weise. Im übrigen freute sich Eliot Fisk, hier in Velbert als Juror mitzuwirken und zu konzertieren. Mit dem Grand Solo des altspanischen Komponisten Fernando Sor in Form der Ouvertüre einer opera buffa eröffnete er Freitag sein Programm. Wunderbar war sein voller, farblich flexibler Gitarrenton. Mit äußerst sensibler Dynamik ließ er die Melodien und Klänge aufleuchten, erhellte Strukturen und Form, machte im langsamen Teil das Zusammenspiel der Einzelstimmen hörbar. Mit hoher Virtuosität erklangen die heiteren Melodien des schnellen Teils. Auch die altitalienische Gitarrenmusik in der Aria con Variazioni von Frescobaldi wurde unter seinen Händen zum Ereignis, ebenso die Bearbeitung von Scarlettis Cembalo-Sonaten. Er gestaltete sie auf der Gitarre dynamisch reicher als es das Cembalo konnte, ohne den silbrigen Originalklang zu vernachlässigen. Höhepunkt des ersten Teils war die Gitarren-Bearbeitung von J.S. Bachs Violinsonate C-Dur. Eindrucksvoll die langsamen Sätze, großartig die gestaltung der Polyphonie in der Riesenfuge, von unübertreffbarer Virtuosität das Finale. Michael Langer, der Solist des auf seine Weise ebenfalls höchstrangigen Konzerts am Vorabend dazu: Das lernt man nur in einem neuen Leben. Nach Gitarrenmusik-Werken aus dem 20. Jahrhundert von Torroba und Castelnuovo-Tedesco begeisterte Fisk sein Publikum mit Transskriptionen zweier Capricci von Paganini. Sie wirkten wie original für Gitarre, von höchster Virtuosität und Spritzigkeit. Eliot Fisk und seine Gitarre waren regelrecht in Eins verschmolzen. Nach dem riesigen Beifall musste er nicht weniger als fünf Zugaben spielen, eine schöner als die andere. Ein großes Erlebnis für alle, die dabei waren! Am nächsten Mittwoch beginnt in Velbert der erste Europäische Jugendwettbewerb für Gitarre. Neben den öffentlichen Vorspielen begleitet ein hochkarätig besetztes Konzertprogramm die Veranstaltung. Die musikalische Begrüßung der rund 100 Teilnehmer aus ganz Europa mit ihren Begleitern übernehmen das Orchester und die Tanzgruppe der Musikschule. Am 21. Juni ab 19 Uhr ist jeder Interessierte im Theatersaal des Forums Niederberg willkommen. Am Donnerstag ist der österreichische Gitarrist Michael Langer zu Gast im Forum. Der mehrfache Preisträger renommierter Wettbewerbe ist bekannt für seine Kombination klassischer Gitarrenmusik mit Elementen von Folk, Jazz, Blues oder Country. Darüber hinaus ist Langer Leiter einer Gitarrenklasse am Bruckner Konservatorium in Linz an der Donau und außerdem als Juror in der Finalrunde vertreten. Das Konzert beginnt am 22. Juni um 20 Uhr. Ein weiterer Weltstar ist am Freitag, 23. Juni, 20 Uhr, im Forum Niederberg vertreten. Der Amerikaner Eliot Fisk ist nicht nur ein international angesehener Schüler des verstorbenen Gitarren-Virtuosen Andrés Segovia dem Namensgeber des Wettbewerbs , sondern ist ebenfalls als Bewertungsrichter in der Finalrunde dabei. Werke von Scarlatti, Bach, Paganini und anderen Komponisten werden zu hören sein. Wer vorab Karten bestellen möchte, kann dies beim Verkehrsverein Velbert ( 02051/95 89 28) tun. Die Preise betragen zwischen elf und 24 DM. Ein Abo aller Veranstaltungen ist für 45 bzw. 55 DM erhältlich. Umsonst ist der Zutritt zu den Wettbewerbsbeiträgen im Kongress-Saal des Forums und bei Karstadt. 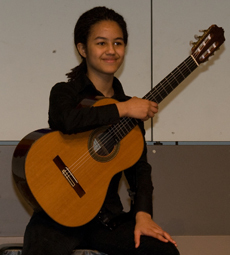 Die Idee zu einem europäischen Jugendwettbewerb für Gitarre existierte bei der European Guitar Teachers Association (EGTA) seit Jahren. Im Juni ist es endlich so weit: In Velbert findet der Andrés-Segovia-Wettbewerb statt. Schon der Name des Wettbewerb lässt erkennen, welch hoher Stellenwert diesem musikalischen Kräftemessen junger Künstler beigemessen wird: Der 1987 verstorbene Spanier Andrés Segovia gilt als eine der Gitarrenlegenden des 20. Jahrhunderts. Als Ehre empfand seine Witwe Marquesa Emilia Segovia die Namensgebung und war deshalb bereit, die Schirmherrschaft des in Europa einzigartigen Wettbewerbs zu übernehmen. Alle zwei Jahre soll er nun hier über die Bühne gehen. Für vier Tage wird Velbert im Sommer sozusagen der Nabel der Welt des bis zu 19-jährigen europäischen Gitarrennachwuchses sein. Wir haben 89 Teilnehmer in drei Altersgruppen, berichtet Giselher Jung von der Musik- und Kunstschule, der mit seinen Schülern Vicente Mozos und Fabian Hinsche selbst Hochkaräter im Rennen hat. Es gab Resonanz weit über Europa hinaus, aber da mussten wir leider absagen, bedauert der Musikpädagoge. 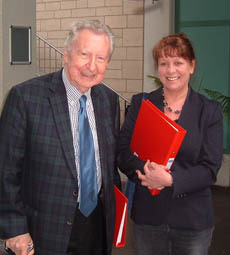 Heinz Jürgen Küpper, als Leiter der Musik- und Kunstschule Mit-Initiator und Jury-Vorsitzender, lobt Verwaltung und Politik, bei denen das Echo von Anfang an äußerst positiv gewesen sei. Allerdings habe erst die Unterstützung von Karstadt dafür gesorgt, dass aus der Idee Wirklichkeit werden konnte. Natürlich habe nicht nur reine Selbstlosigkeit zum Engagement geführt, wie Peter Weitenhagen, Geschäftsführer der Velberter Karstadt-Filiale, unumwunden zugibt: Wir sind der Meinung, dass Erlebnis dazu gehört, um Kunden langfristig zu binden. Weil die Zusammenarbeit mit der Musik- und Kunstschule bisher gut funktioniere - etwa in Sachen Musical -, habe sich das Sponsoring dieses Wettbewerbs mit Geld und Sachmitteln angeboten. Alfred Eickholt, Bundesvorsitzender der deutschen Sektion der EGTA, freut sich darüber, dass mit dem neuen Wettbewerb eine große Lücke worden sei. Jugend musiziert beispielsweise böte sich für Solo-Gitarristen nur alle drei Jahre an. Außerdem würden nicht nur Geldpreise, sondern auch Stipendien vergeben. Begleitet wird der Wettbewerb vom 21. bis zum 24. 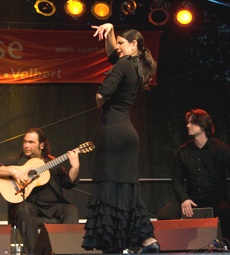 Juni mit einem großen Rahmenprogramm von Konzerten und einem Flamenco-Abend.